Wolverhampton Wanderers are reportedly considering a surprise move for AS Monaco striker Radamel Falcao during the winter transfer window. 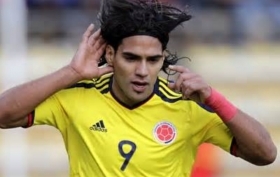 Colombia international forward Radamel Falcao could be set for a move to Major League Soccer, amidst interest from the USA for the Monaco front man. It is understood that Monaco are ready to let Falcao leave the club for a nominal fee in the January transfer window. Radamel Falcao has accused referee, Mark Geiger of being biased towards England who defeated Colombia on penalties in the second round of the ongoing World Cup in Russia on Tuesday. Jesse Lingard has heaped praise on Colombia striker, Radamel Falcao ahead of England's game against the South Americans in the round of 16 of the ongoing FIFA World Cup in Russia. Senegal coach Aliou Cisse has said the he sees no reason why his Senegal team cannot qualify from group H.
French club Marseille have reportedly reached an agreement to secure the signature of Monaco frontman Valere Germain. In the past year, AS Monaco have captured the imagination of the footballing world by relying on their free-flowing attacking style of play, and emphasis on youth development to lead them to the French league title and a Champions League semifinal. Colombia international Radamel Falcao has hinted that he could stay put at Monaco for the final year of his contract. Despite Antoine Griezmann appearing to look like he will stay at Atletico Madrid next season, the club fear that he may leave the Vicente Calderon because of the £86 million buy out clause in his contract. In a game that promised goals after a fascinating first leg, Monaco and Manchester city produced another four goals, as the French side won 3-1 on the night, progressing through to the quarter finals of the Champions League on away goals, after a 6-6 aggregate scoreline. The match at the Etihad last night served up an eight goal thriller, with some attacking worthy of the Champions League, but also some defending, that at times, was worthy of non-league, as Manchester City came out 5-3 winners. Valencia are interested in a summer deal for Chelsea flop Radamel Falcao. The Colombian recently had a medical on his return to AS Monaco. Premier League newcomers Middlesbrough are weighing up a surprise move for AS Monaco striker Radamel Falcao. The Colombian has largely flopped in his previous loan spells in the top flight with Manchester United and Chelsea. Belgian international Romelu Lukaku will earn his dream return to Chelsea once Everton confirm the appointment of a new head coach. The 23-year-old has already stated his desire to join a bigger club capable of winning trophies. So, Jose Mourinho is now the new Manchester United manager. Being a huge Chelsea fan I'm not going to lie, it hurts to see him at Old Trafford. But I am willing to forgive him as long as he hands The Blues six points next season. Then again, if the same Mourinho that ended his reign at Chelsea turns up at United, he will be handing out points to everyone. It is rather ironic that Mourinho, whose biggest Achilles heel has been uniting a dressing room for a long period of time has gone to a team named "Man United". There's no denying that Jose Mourinho is The Special One, although he looked more like The Special Needs One last year. Italian giants AS Roma are keen on acquiring the services of Radamel Falcao once his loan spell expires at Chelsea in the summer. Colombian international Radamel Falcao is hopeful that he can remain at Chelsea beyond the current season. The Monaco striker joined the West London giants on a season-long loan last summer in spite of his failures with Manchester United during the previous campaign. Chinese club Jiangsu Suning are eager to end Radamel Falcao's nightmare spell at Chelsea this month. Radamel Falcao to end Chelsea Nightmare? Colombian international Radamel Falcao has been tipped to return to parent club AS Monaco in the winter transfer window. Turkish giants Fenerbahce are ready to offer an escape route to on-loan Chelsea striker Radamel Falcao.